It’s 1 year since the NSA leaks, and we’ve used our analytics and visualisation tools to crunch 10,146,900 tweets that mention Edward Snowden. It seems the first ever tweet to mention Edward Snowden was from Janine Gibson (3 minutes before Glenn Greenwald himself). We created a visualisation to show how, once his identity became public, the mentions of Snowden quickly overshadowed the mentions of the NSA and Prism. We found 8,836,300 unique accounts that had mentioned Snowden in a tweet. Here are the 10 that were most retweeted or mentioned with regards to Snowden. 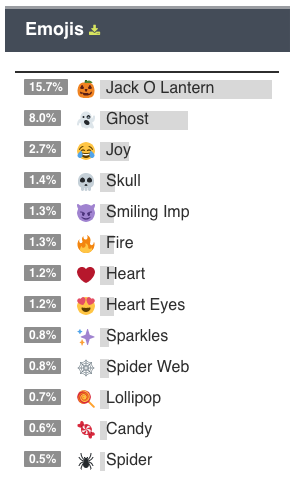 Below are the top tweets, hashtags, words and urls. Initially Washington appeared as the city with the highest number of tweets. By the second month, Caracas was the highest, as Snowden was offered asylum by President Maduro. Since then top cities have remained fairly consistent with New York, London and Washington all being in the top spot at different times. This chart shows the percentage of tweets that contain 'patriot' or 'traitor' when discussing Snowden. Obviously this can include reporting of other people's opinions rather than just reflecting the overall options of Twitter users, but it is still interesting that there were a couple of months where the order flipped. #IJF14 (the annual International Journalism Festival) in Perugia, Italy, finished yesterday, and it looks like it’s been another interesting and popular event. 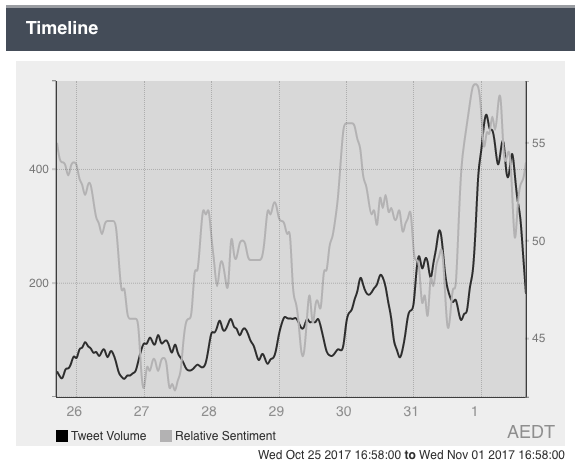 We were proud to develop the official IJF event dashboard in collaboration with Buzzdetector, and for this post we’ve also used our visualization and analytics tools to dive deeper into the most popular moments of the festival. Below is a visualization which displays the top terms over the 5 days of the festival. Please note that the locations used includes the location listed in an account’s profile, and the time displayed is your local time. 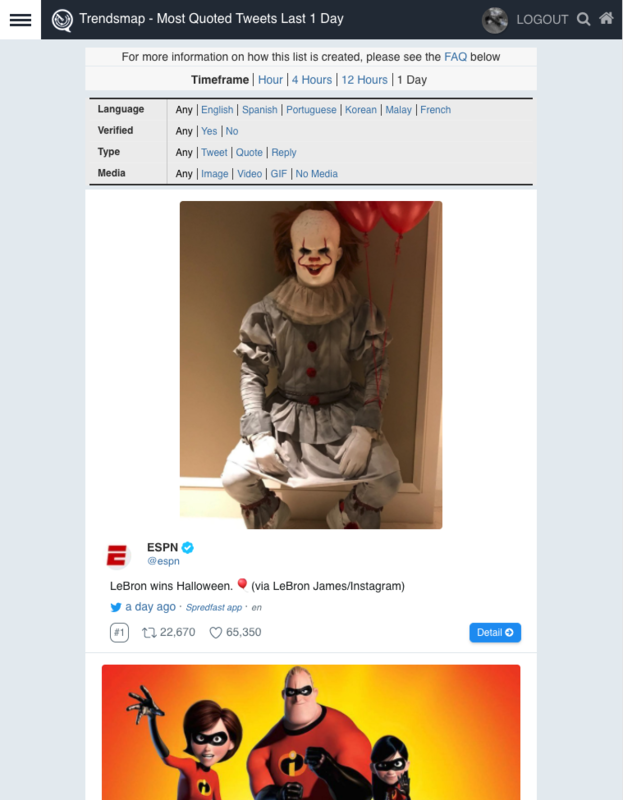 Here follows some key statistics about the event, and we’ve included some custom timelines for the top tweets, images, videos and URLs. 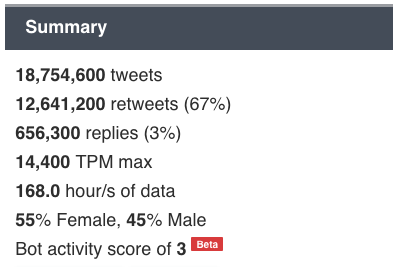 During the event we tracked 50,300 tweets from 10,188 different accounts. Ellen and the Oscars may have broken Twitter, but it looks like in most locations in the last 24 hours there were more tweets about the Ukraine. 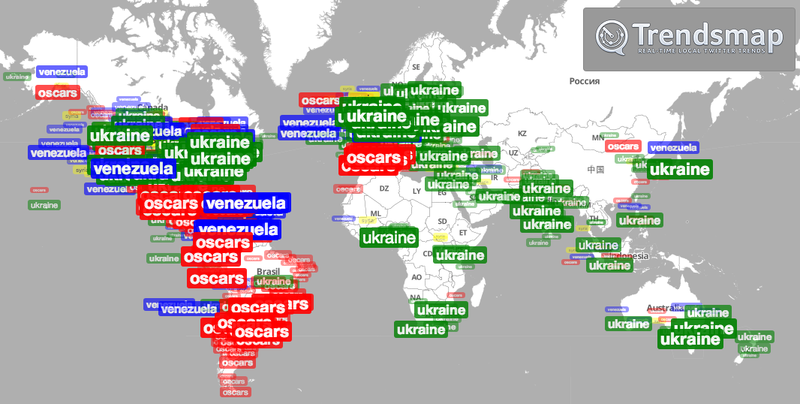 These images illustrate geo-locatable mentions for Oscars, Ukraine, Venezuela and Syria. They cover the 24 hour period from 2 hours before the Oscars red carpet begins. To create these images we used a new tool we are testing which enables us to plot multiple topics on the same map. Contact us to be notified when this tool will be available. Obviously these would mostly only capture English language speakers, and only those tweets that can be located, but even so this demonstrates that the Ukraine is a huge discussion in pretty much every region of the world. Venezuela is also a big topic, but mentions of Syria are tiny in comparison. And finally, a word of warning. The Kids Choice Awards don’t happen until March 29th, but they look like they could be bigger than the Oscars. The 2014 Brit Awards have just wrapped up, and the One Direction chaps and their chums have helped make it a global event on Twitter. 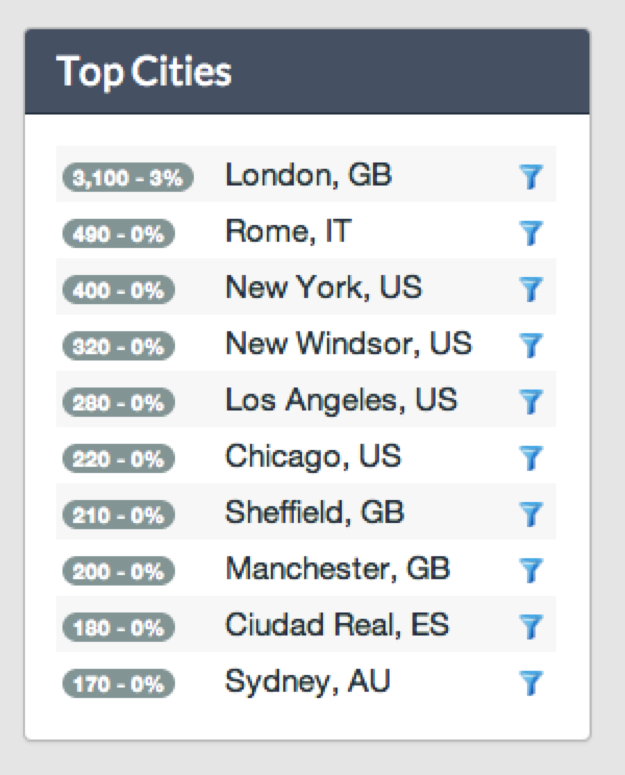 We set up an Analytics to pick up all tweets that contained the official hashtag (#Brits2014), and 24 hours before the event started we noticed that only 3 of the top 10 cities were from the UK. Obviously when it comes to music on Twitter, One Direction does tend to skew things, and their fans from all over the world were obviously pushing for them as hard as they could. We also noticed that @5sos actually had the most retweeted tweet at that stage. As an aside, recently we have been seeing 5 Seconds of Summer trending more frequently than even One Direction. There have been more than 35 official trends featuring ‘5sos’ just in the last 2 weeks. 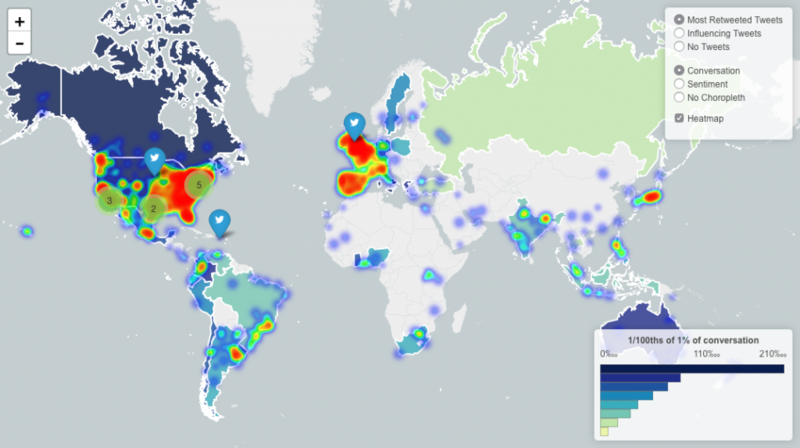 As the event unfolded we saw activity all over the world, and just over 2m tweets mentioning the official hashtag. Through our iTrended service, we were also able to see the official Twitter trends that mentioned ‘Brits’, and sure enough, the One Direction associated hashtag trended in more locations than the official hashtag. Here are links to the iTrended reports for the #BritsOneDirection and #Brits2014 trends. * Locations is a minimum value. Over this time period it may have covered more locations. We are very proud to announce that iTrended.com (a Trendsmap product) has been featured as a Technology partner by the Twitter Media team. Hats off also to Stackla, but despite various reports in the Australian press, Stackla is not the first and only Australian partner! iTrended.com gives detailed reports on official Twitter trends, showing when a trend went global, what cities and countries it trended in, for how long, and at what positions. On 23rd November 2013 it will be the 50th anniversary celebration of Doctor Who. A special feature-length episode will be broadcast simultaneously (including in some 3D cinemas) in 76 countries. 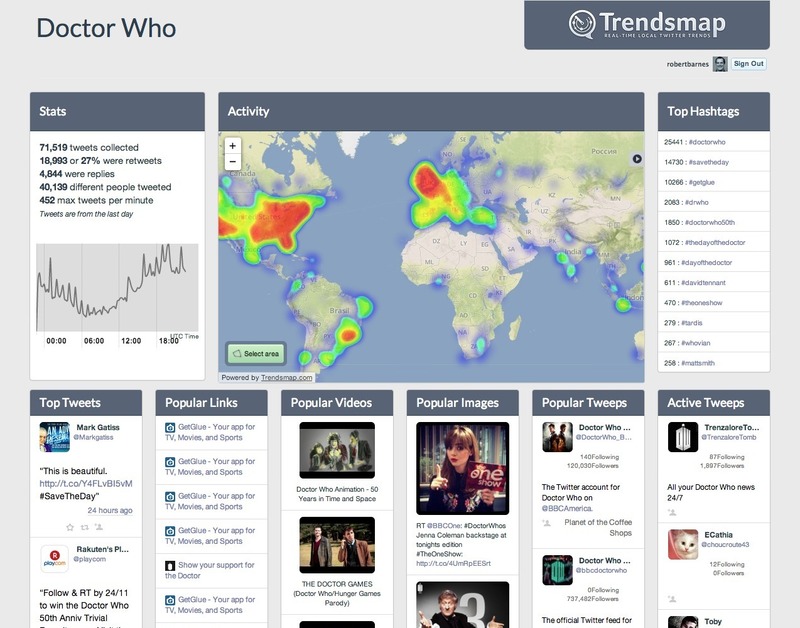 Whovians are already getting excited as you can see at our custom Doctor Who dashboard. (You can learn more about our Dashboards here). We’ve also created a Tweet map where you can see locations of individual tweets about #savetheday. It’s been a while between updates but we have have spent that time teaching Trendsmap five more languages and launched more than 240 new location pages. Trendsmap can now natively process Arabic, Turkish, Russian, Italian, and Swedish tweets in addition to the existing ones of English, Spanish, Portuguese, German, French, and Dutch. This means we can now provide even more detailed and relevant trend information in areas where these languages are spoken. We have already seen a big impact in the number of trending terms that Trendsmap displays in the Middle East, Europe and Russia. 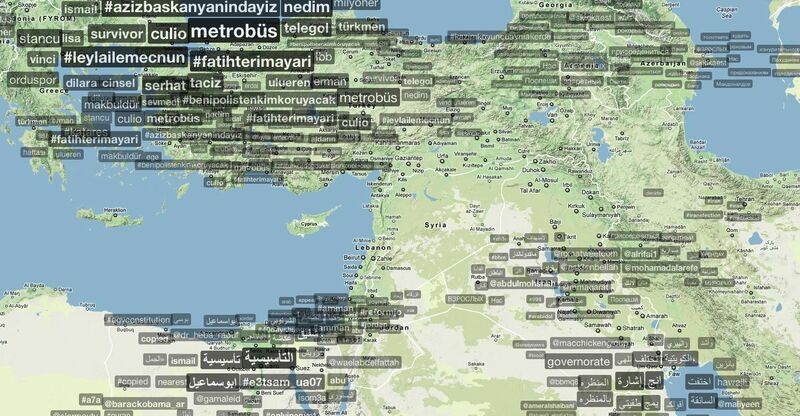 Trendsmap showing a number of countries with improved trends including Turkey, Egypt, Syria, Iraq, Kuwait and Saudi Arabia. We have also added 244 new locations with their very own local page across the globe, mainly in areas where our improved language coverage such as the Middle East, Russia, and parts of Europe. In the Middle East a number of important cities have been added including recent news hotspots such as Damascus in Syria and Tripoli in Libya, as well as a number of smaller, previously unlisted cities in the region. For a full list of the over 1300 local pages we now have, please see our Locations Page. We are now also doing more processing of data in areas where other languages are typically used. This means that there is now a lot more hashtag and user trends in popular Twitter areas like South Korea and Japan. 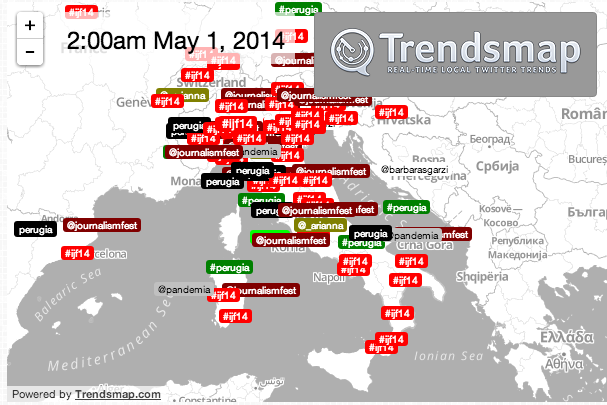 This gives Trendsmap an even more detailed trend coverage across the globe than it has ever had. Twitter has grown dramatically over recent years. As such we have had to grow as well in terms of the volume of tweets we are processing. Combine this growth with extra languages and additional data from a number of regions, we have gone from processing around 4 million tweets per day when we first started in 2009, to now processing over 60 million tweets per day from across the globe. This means more trends, in more places as there are more tweets in areas where previously we wouldn’t have been able to extract a trend. This increase has also allowed us to add in more locations, and we hope to continue to add more of these as possible. …no one would blame you for thinking that Google’s Gmail can be controlled by movement, Youtube is 100 years old, or that IKEA have made a high chair for dogs. 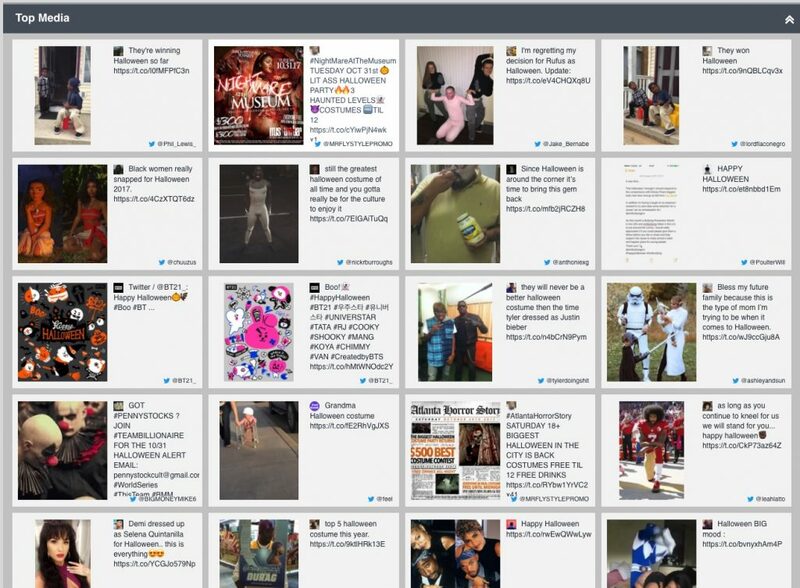 As Trendsmap shows us the interwebs were so abuzz with rumors, jokes and pranks that I’m sure even veterans of the internet had to think twice before writing off some ‘news’ as bogus… It was a crazy news day! So, all in all, it was a good day to pretty much ignore the news completely, or from a PR perspective, maybe it was a good time to get some bad news out in the public sphere as it was likely that no one would believe you anyway! If anyone has dirt on me can you blog it tonight? @TechCrunch has an article that seems serious but I can’t tell for sure because it’s 4-1. Below are some of these! Enjoy.